Stevie’s thumping away at his new drum kit. And Josh is recording some music in the studio that sounds pretty loud. So we’ve moved to the quiet sanctuary of Orb’s art space. We say quiet but as soon as we start talking a carpenter starts hammering in a few finishing touches to the new fire doors. There’s always something going on at Orb. Today we’re going to have a chat with Mark. And shed some light on how Orb got its name. That’s a pun in case you miss it. Don’t worry it’ll all make sense soon. Back in the carefree days of Mark’s hedonistic past, he earned a crust as lighting engineer with a local band in Exeter called Sahara. Legend has it that during a gig Sahara found a discarded disco mirror ball hidden away, cowering beneath a stage. They took pity on it and decided to give it a new home, touring with them as part of the act. It didn’t take long for the mirror ball to prove its worth, as a quirky but creative tool for reflecting and shining light about during gigs. But a life on the road soon took its toll and poor little mirror ball lost some of its lustre while rolling about untethered in the back of a van. 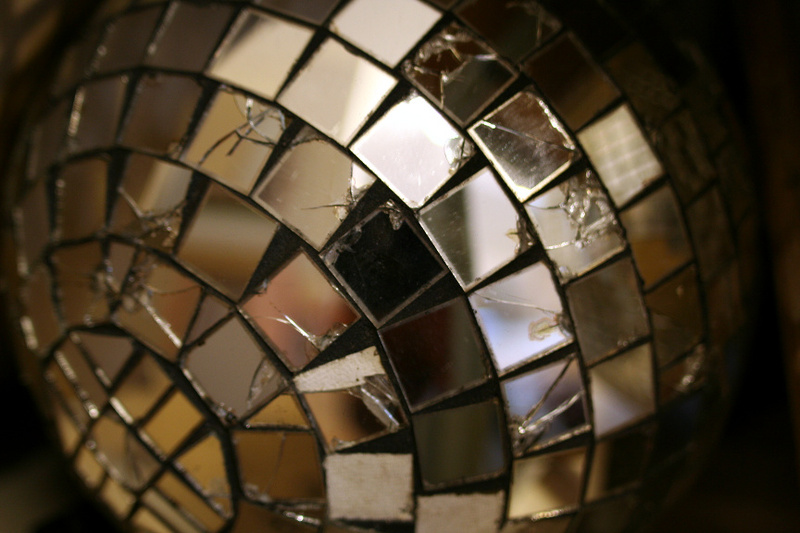 Fragments of mirror broke off and soon dents and other imperfections became part of its character. Said the late Gwyn Jones, respected local musician, colleague and friend of Mark. Looking at the first part of that sentence, you’d be forgiven for thinking that Gwyn was referring to the damaged state of the mirror ball. In fact it was an important insight into how it stood for much more. Fast-forward a few years and Mark was looking for a name for his new venture. He’d had an idea for a support service helping vulnerable individuals with severe or enduring mental health problems. It would be creative, encompass both art and music and bring out the best in people at risk of being cast aside or neglected by society. People who might be a little dented, bruised and affected by their experiences. It did to Mark. The orb of wonderment was about to have its finest hour and give its name to a very special mental health support service. Mark had spotted a powerful metaphor in the orb: from something that may seem a little damaged, given a chance to shine it’ll dazzle, inspire wonder and show just how unique and special it is. 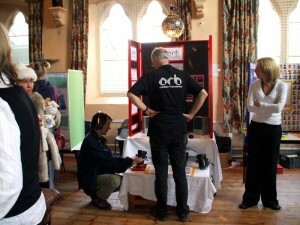 It’s multifaceted too, like everything we do at Orb with our music recording studio, art space and computer suite. And like a mirror ball, the overall effect is bigger than the sum of its parts too. Each little mirror is like our members, team, funders and volunteers. Put them all together and the effect is awe inspiring. The orb of wonderment or ‘the orb’ as it’s now known still gets about a bit. Not one to sit around gathering dust any more, you can see it appearing in shows and performances around Harrogate and Knaresborough. In fact, at this very moment it’s hanging from the stage in the Frazer theatre. It’s also been known to go on the road occasionally, just like the old times. Although it’s become something of a diva recently, preferring an executive cardboard box to the rock ‘n’ roll days of rolling about in the back of a van attacking rock cover bands. We’re especially proud of every tiny mirror that makes up our orb of wonderment. We’d be nothing without you our members, funders and volunteers. Here’s to all the shining light we’ll be dazzling the world with in 2011. Merry Christmas to everyone in the Orb community and thank you!